Well, in this article, you can get the entire information related to RRB Bilaspur Group D Recruitment 2018-2019. A few days back, the organization of Railway Recruitment Board has released the RRB Bilaspur Group D Jobs 2018-2019. So, all the people are advised to Apply 1159 rrbbilaspur.gov.in Grade IV Vacancies 2018 through Online Mode. This is the best job opportunity for the job seekers those who are hunting for the Chhattisgarh Govt Jobs. Moreover, all the willing and eligible people are suggested to apply for latest RRB Bilaspur Group D Openings 2018-2019 in between 10th February 2018 to 31st March 2018. 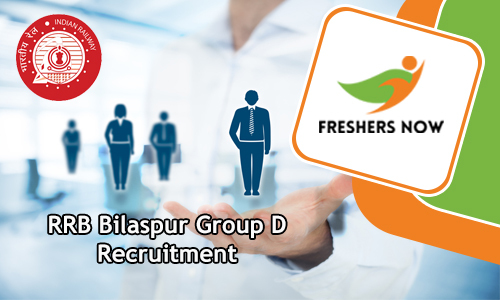 We are pretty much sure that, you can get overall information regarding Application Fee Details, Pay Scale information, official Notification, Selection Process, Post Wise Vacancy Details and steps to apply for RRB Bilaspur Group D Recruitment 2018-2019 etc. So, all the aspirants are insisted to check the complete post and get the minimum idea of RRB Bilaspur Group D Recruitment 2018-2019 details. Therefore, many of the people belongs to Chhattisgarh State are in search of Railway Jobs. For all those hunters the current RRB Bilaspur Group D Jobs 2018-2019 are very useful. So, keep calm and refer the entire article thoroughly. So, that you can easily understand the Eligibility Criteria information. Moreover, the authority of Railway Recruitment Board only accepts the Online Applications from the candidates. So, as per the latest news, many of the seekers are in a race to utilize the valuable chance. But no one can’t find accurate information so that we have designed this post and arranged the details in a clear manner. Are you one of the people looking for Railway Jobs? if your answer is yes then without late just take a complete look at this article. Moreover, to give you an entire info we have tried our level best and gathered the most valuable data and shared in this article. So, our main aim is to help the candidates in their difficult time. That the reason to create this post and given RRB Bilaspur Group D Recruitment 2018-2019 information. And also, many of the candidates asked to share the post wise vacancy details. Therefore, to get the post wise vacancy details simply refer the below section. Moreover, the Education Qualification is the primary for all the people those who are planning to apply. 10th class or ITI or its equivalent from NCVT or SCVT in India is an essential qualification to apply for 1159 Grade IV Vacancies 2018-2019. The complete RRB Bilaspur Group D Recruitment 2018-2019 Notification details are available in this article. The minimum age to apply for RRB Bilaspur Group D Jobs 2018-2019 is 18 years. Meanwhile, the maximum age is 31 years. We are informing the people that the Age Relaxation also applicable for all the backward candidates. Actually, the organization of railway Recruitment Board extends the closing date that is 31st March 2018. Because many of the people are showing their willingness in applying the RRB Bilaspur Group D Vacancy 2018. And coming to the application fee information. After filling the mandatory details, you have to pay an Exam as per the rules and regulations of Railway Department. Moreover, all the contenders must and should pay only in Online Mode. General category candidates need to pay Rs. 500/-. In addition, to this, all the other (SC/ ST/ Ex-Serviceman/ PWD/ Female etc) should pay Rs. 250/- as an application fee. Many of the aspirants are eagerly looking to check the Selection Process details. So, at first, the Railway Recruitment Board will conduct Written Test (Computer Based Test). After that, Physical Efficiency Test (PET). So, those who will clear these rounds are called for Document Verification and Personal Interview. Moreover, the board will filter the suitable candidates for selection rounds. So, all of the applicants must and should prepare well and perform well in the selection rounds. And clearing the selection rounds in railway Department is not an easy task. All you need is a proper preparation. Therefore, in the official RRB Bilaspur Group D Recruitment 2018-2019 Notification, the authority stated that they will offer pay scale of Rs. 18, 000/- Per Month. Also, visit the official web portal rrbbilaspur.gov.in frequently. The selection of the people is based on the following rounds. So, check all the selection rounds and prepare well. Many of the aspirants are planning to apply for RRB Bilaspur Group D Recruitment 2018-2019. for all those contenders the above-given Age is primary. And one more good news for the people is Age Relaxation is applicable as per the government norms. Well, most of the people are finding to check the Salary details. And don’t worry about the pay information because of all the selected people can get an Rs. 18, 000/- Per Month. Coming to the education qualification details, applicants must and should be done their 10th class or ITI or its equivalent from NCVT or SCVT in India. All the General candidates need to pay Rs. 500/- as an application fee details. Remaining should pay Rs. 250/-. Before applying for RRB Bilaspur Group D Recruitment 2018-2019 just refer this section. Find the direct RRB Bilaspur Group D Recruitment 2018-2019 Notification link from the above section. Moreover, to get the latest recruitments just visit our website freshersnow.com.